It's already been on sale in China for a while, but here's our first look at the Euro-version of Citroen's crucial new mid-size SUV competitor, the C5 Aircross. The new Citroen SUV is based on the same basic mechanical package as the Peugeot 3008 and 5008, and aims to tread-an ultra-practical middle ground between those two models. It's not a seven-seater, but Citroen says that the C5 Aircross has three individual, tilt, fold, and slide rear seats, which should (though we'll have to wait to test this out) be able to take three child car safety seats side-by-side. There's also a massive boot, which holds from 580 litres to 720 litres, depending on how far forward you slide those back seats. On the outside, the C5 Aircross picks up the styling baton from the C3 and the C4 Cactus - it has a big, bluff front end that's a little more horizontal in its styling than the smaller cars, all the better to show off those broad shoulder lines. The bonnet is heavily sculpted and there are the new Citroen styling signatures of double-decker lighting at the front, and 'Airbump' side panel protectors, this time set down low on the doors, as with the recently-updated C4 Cactus. Buyers can choose from 17-,18-, or 19-inch wheels, and there are seven body colours, a contrasting roof colour option and the option of three exterior highlight colour packs, in silver, white, or red, which add a little more character and definition. Inside, as with the Peugeots, there's an all-digital cockpit, with a 12.3-inch TFT screen in front of the driver and a big eight-inch touchscreen in the centre, flanked by two big air vents. Unlike the Peugeots, the steering wheel is a conventional size, with a flat-bottom, and the centre console is high-up and heavily padded, for a more luxurious feel. There's a choice of interior colour and styling schemes - standard, 'Wild grey,' 'Metropolitan Beige,' 'Metropolitan Grey' and 'Hype Brown.' Those last three all come with leather upholstery. 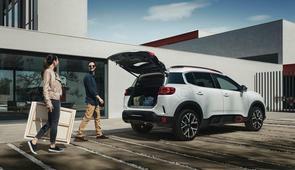 On the engineering front, the C5 Aircross comes with the full suite of Citroen Advanced Comfort systems - so there's extra sound deadening panels to improve interior refinement, ultra-comfy seats and the 'Progressive Hydraulic Cushions' - special bump-stops atop the suspension, which are said to give exceptional ride comfort. There's a broad suite of safety equipment available including active autonomous braking, lane keeping assistant, active cruise control with stop-go function, collision alert, driver attention alert, traffic sign recognition and the Highway Driver Assist system, which helps keep you in lane and a safe distance behind the car in front, when driving on the motorway or main roads. There's also Grip Control traction control for tricky surfaces, active high-beam headlights and some useful interior tech touches including wireless phone charging, active parking assistant and keyless entry and start. The big touchscreen comes with Apple CarPlay and Android Auto, and buyers can have the ConnectedCamera mounted in the windscreen, which you can use to take photos to share on social media and which acts, automatically, as a dash-cam, constantly recording the last 30 seconds of what's been happening. At launch, there are four engine options. Two petrol options - the 1.2-litre PureTech 130hp unit, and a 180hp 1.6-litre THP four-cylinder engine - plus two diesels: a 130hp BlueHDi 1.5-litre engine, (which can be had with an optional eight-speed automatic gearbox) and a 2.0-litre 180hp unit.